Grandpa's Dumplings - You're Making a Mess!You're Making a Mess! Growing up, my mom’s mom was the undisputed queen of the dumpling. My maternal grandma and grandpa owned a Czech restaurant called the Country Kitchen (no relation to the chain) that specialized in all the favorites: roast pork and dumplings, svickova (marinated beef with a sour cream gravy), koprova (dill pot roast, yep, sour cream gravy) — the list goes on. 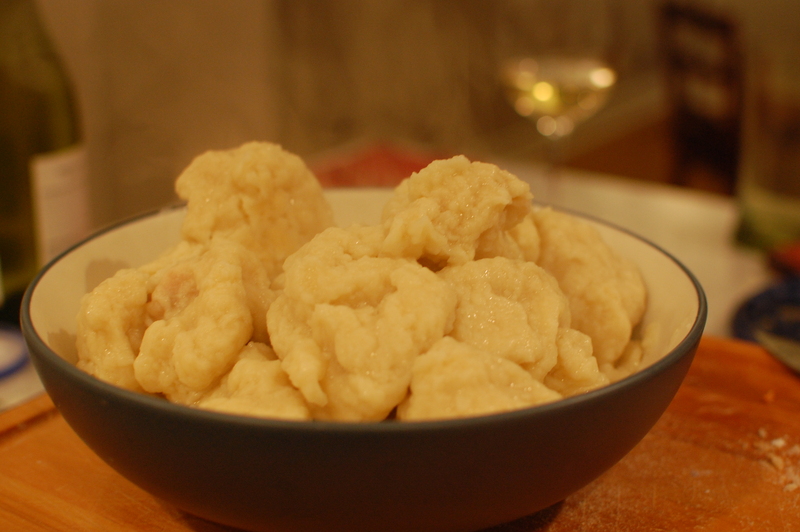 Her dumplings were generally yeast dumplings, perfect sponges to soak up the gravies. All of her food was delicious, homemade, and the perfect winter meal to fatten you up and entice you to spend the rest of the night curled by the fire. Today, however, I highlight my dad’s dad’s dumplings. I made them last night, and that probably was the third time in my life that I’ve eaten them. I’d consider my grandma’s dumplings “the ones I grew up with”, but my grandpa’s as an exotic spin — familiar as a bready pork accompaniment, but unlike the gravy soakers I was used to. His are an egg dumpling, devoid of yeast, described by him and others half-derisively as “sinkers”. They’re heavier than a yeast dumpling, but chewier and somehow more satisfying. 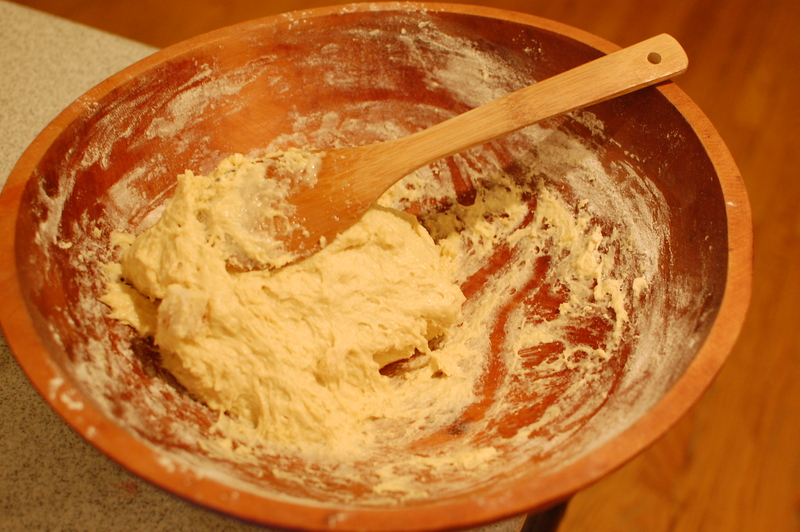 Old time recipe calls for a wooden bowl, this will do! Part of the fun making this recipe was deciphering the handwritten version, most recently transcribed in the mid 90’s, but undoubtedly passed along for at least a few generations. If you’ve never recreated a dish passed down by your grandparents, do it! 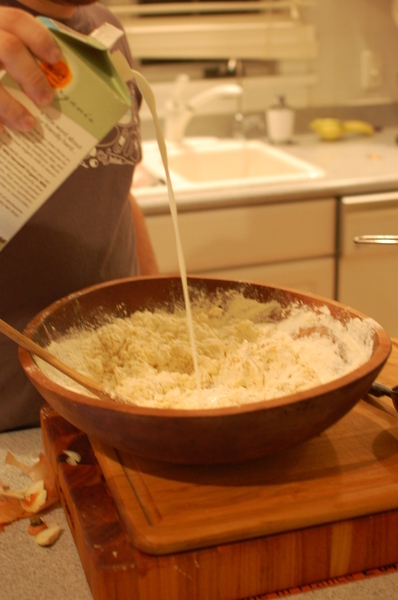 The recipe itself is simple, but the results fantastic — as readers of this blog may have noticed, I have an affinity for eggy flour concoctions. I made the dumplings to go along with my favorite chicken recipe, and they added a perfect texture and flavor to the chicken and vegetable gravy. Give them a shot — below is my description of the recipe, but I’ve included a scan of the authentic version too, for posterity. Toast the white bread. Cut into cubes, discard crumbs. Put a big pot of water on to boil. Your biggest pot — these guys need some room. Sift flour and salt into a medium sized bowl. Sifting is important, as we want all of the lightness we can get since these dumplings don’t have any leveners of their own. Beat the eggs in a separate bowl with a whisk (I used an egg beater but a hand whisk would be fine too). 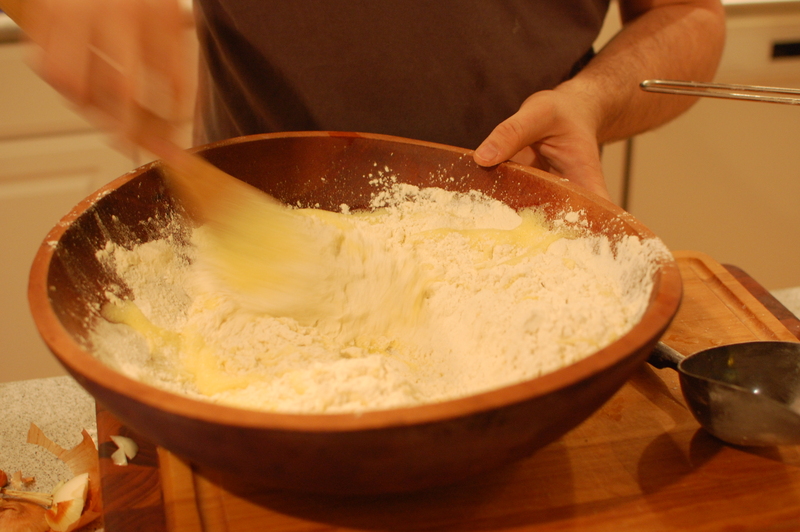 When they’re frothy, add them to the flour mixture and stir with a wooden spoon. Add the milk until the dough is the consistency of putty. Stir in the bread cubes. Form dough into golf-ball sized clumps and add them to the water. I found that the best way to do this is to wet my hand and then grab a handful, form quickly into a ball, and drop in. When the dough starts to stick, wet your hand again. 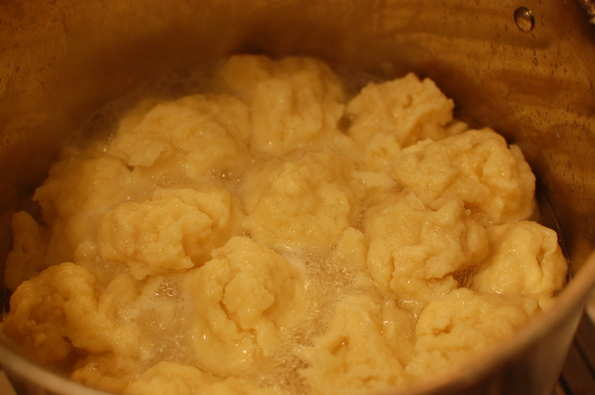 Boil dumplings covered for 30 minutes, stirring after the first 5 minutes (make sure none are stuck to the bottom) and about every 10 minutes afterward. It’s not a huge problem if some of them aren’t fully in the water — just make sure to have the cover on so the steam cooks them. Pull them out of the water after a half hour and slice immediately.